What a novel idea of creating a pair of siblings that hunt evil spirits together. Did you know they were twin sisters with two different styles and personalities? The title alone is enough to create interest in this new Image title. The book begins with a nice wedding where the groom is dragged to hell by a devil looking demon. Kate and Cate are brought into solve the odd disappearance. We are dropped into their little world quick without warning. They take their roles sort of seriously. They take everything dark around them with grain of salt. It seems to hard to surprise the pair. 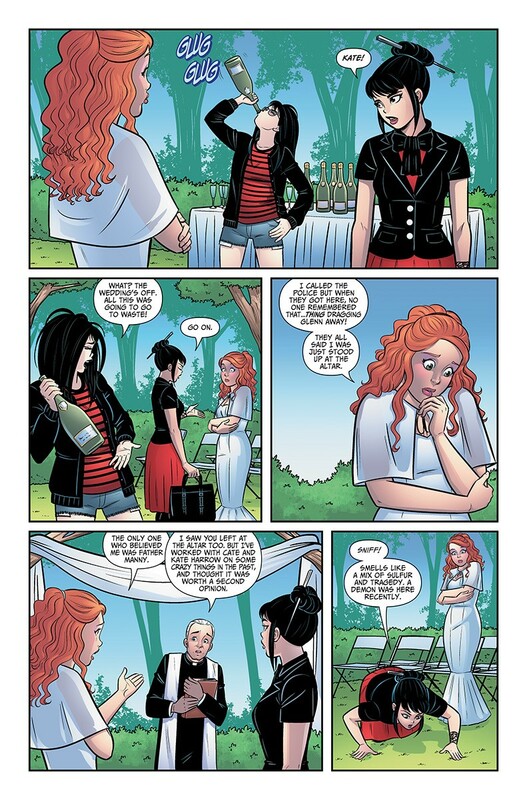 The art actually resembles an Emo Goth Archie look. The look does come with some nice details. It also makes the story not overly threatening to our main characters. It makes the comic fun enough to wonder what happens in the next story. The cliffhanger/mom introduction at the end also helps improve our interest in these dark twins. Image Comics: Coming Soon: The Exorsisters!